1 of 3 Preheat oven to 400 degrees F. In a small bowl, combine egg and the water; set aside. Line a large baking sheet with parchment paper; set aside. Unfold pastry onto a lightly floured surface. Roll pastry into a 12-inch square. Using a pizza cutter, cut a 1/2-inch strip from each of the four sides of the square. Brush edges of pastry square with egg wash. Transfer pastry to prepared baking sheet. Attach a pastry strip to each side of square to form an edge; brush again with egg mixture. Prick pastry with a fork. 2 of 3 In a small bowl, stir together sugar and ginger. 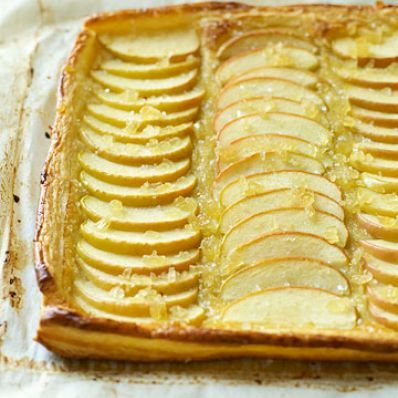 Arrange apple slices over pastry, overlapping as necessary. Sprinkle with sugar mixture. 3 of 3 Bake for 20 to 25 minutes or until pastry is deep golden brown and crisp. Cool on baking sheet on a wire rack. Transfer to a cutting board or platter.